The crew of the "Abdala" suspected water in the heavy oil in pos. 54 41 N 05 45 W on Feb 12, 2018, and was taken in tow by the tug "Waterman". The Belfast Coastguard set up a communication plan with the vessel. The problem was successfully repaired and the vessel resumed its voyage. The bulkcarrier was en route from Belfast to Londonderry, with a crew of 24 on board, carrying a cargo of 17.000 tonnes of coal. 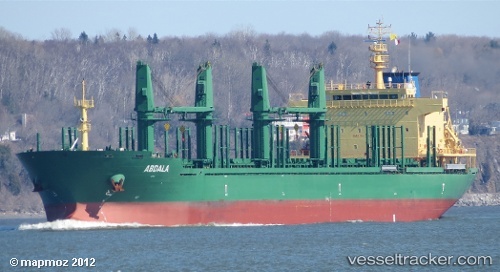 The ship berthed in Derry harbour at 7 p.m.
As a first of an undisclosed number of vessels to come, a Shanghai shipyard delivered a bulk grains carrier to Cuban officials. The 35,000-ton Abdala was built under an agreement between Chinese state company China National Machinery Import & Export Corporation (CMC) and Cuba’s Empresa Importadora General del Transporte (EIGT) that will boost the tonnage of Cuba’s merchant marine. The cost of the vessel and financial terms of the agreement have not been disclosed. The purchases are financed by China’s Eximbank. Employees of Cuban state company Acemex supervised the construction of the ship.